By law a landlord needs to have their electrical equipment tested for safety when renting their property. 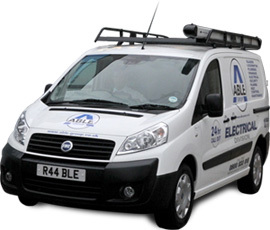 Able Electric has professional electricians on call 24/7 wherever your property is in the UK. Providing portable appliance testing and electrical surveys, our electrical testing services are second to none with competitive prices. You can talk to one of our friendly operational staff anytime of the day to find out further information about landlord certificates. The Able Group can also provide gas certified engineers so that your property will fully comply with your local landlord safety requirements.